A note from Rebecca: This event has been planned for a long time. But after the election, we’re making it a focus on cities as cosmopolitan places of coexistence, tolerance, subversion, resistance, and joy, of Black, Asian, Latino, Muslim, Jewish, Quaker, immigrant, queer, drag, trans, feminist lives and victories. Please join us tomorrow evening for this free community celebration. 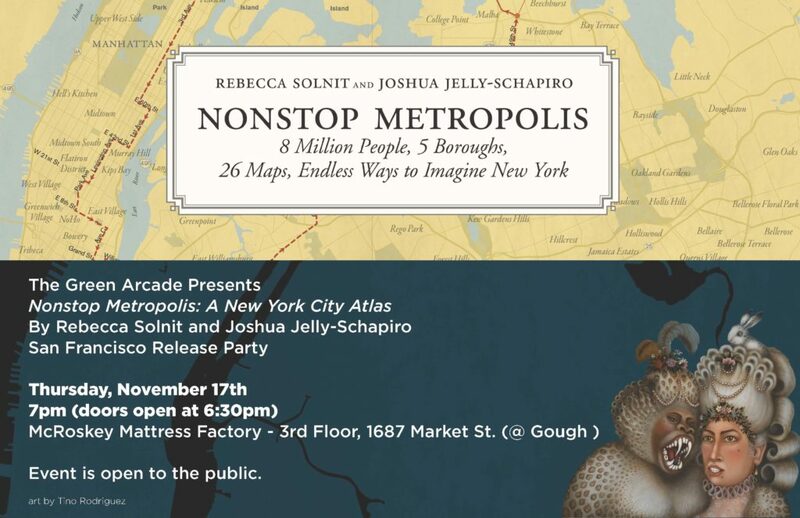 Nonstop Metropolis, the culminating volume in a trilogy of atlases, conveys innumerable unbound experiences of New York City through twenty-six imaginative maps and informative essays. Bringing together the insights of dozens of experts—from linguists to music historians, ethnographers, urbanists, and environmental journalists—amplified by cartographers, artists, and photographers, it explores all five boroughs of New York City and parts of nearby New Jersey. We are invited to travel through Manhattan’s playgrounds, from polyglot Queens to many-faceted Brooklyn, and from the resilient Bronx to the mystical kung fu hip-hop mecca of Staten Island. The contributors to this exquisitely designed and gorgeously illustrated volume celebrate New York City’s unique vitality, its incubation of the avant-garde, and its literary history, but they also critique its racial and economic inequality, environmental impact, and erasure of its past. Nonstop Metropolis allows us to excavate New York’s buried layers, to scrutinize its political heft, and to discover the unexpected in one of the most iconic cities in the world. It is both a challenge and homage to how New Yorkers think of their city, and how the world sees this capital of capitalism, culture, immigration, and more. 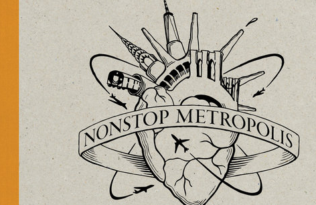 Learn more in our Nonstop Metropolis blog series. Rebecca Solnit is a San Francisco writer, historian, and activist, and the author of seventeen books about geography, community, art, politics, hope, and feminism. She is the recipient of many awards, including the Lannan Literary Award, and the National Book Critics Circle Award. A product of the California public education system from kindergarten to graduate school, she is a contributing editor to Harper’s, where she is the first woman to regularly write the Easy Chair column (founded in 1851). Joshua Jelly-Schapiro is a geographer and writer whose work has appeared in The New York Review of Books, New York, Harper’s, and the Believer, among many other publications. He is the author of the newly-released Island People: The Caribbean and the World.